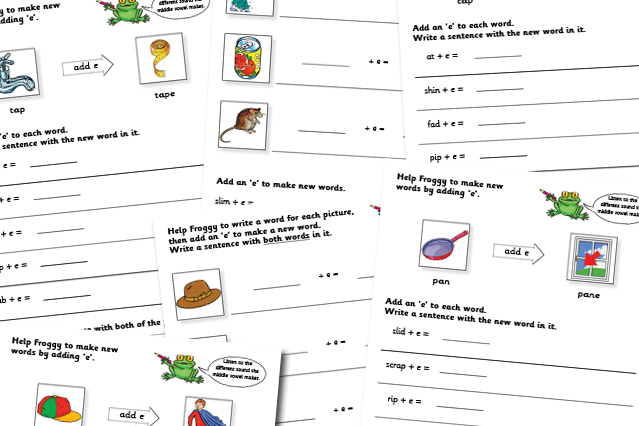 This month we are pleased to offer Froggy’s Adding E to C-V-C worksheets. These sheets are ideal for supplementing phonics work relating to level 7 of the interactive Froggy Match-it games, and deal with split digraphs. The sheets look at how adding an e to short vowel words changes the sound of the vowel from a short to a long one, as in tap and tape, hop and hope, and slid and slide. Get the free Adding E to C-V-C sheets here. Look out each month for extra, free resources from Froggy Match-it and help your child to really learn and practise their phonics. The extra sheets are available from the Froggy Match-it website and are completely free. All those who follow Froggy Match-it on facebook or twitter or subscribe to the emailing list will be the first to know about each new set of free phonics worksheets.